Summer challenge time! Are you ready to transform? If you’ve dreamed of writing professionally–making $$$ from your words–the time is now. But how? What are the steps? How do I avoid distractions and the dreaded writer’s block? Where can I find creative exercises? When do I know I’m no longer a hobby writer and that I am a pro? Well, bud, you help yourself, but here’s a manual that can help you Think like a Pro. Think like a Pro guides your growth through 7 lessons. From deadlines to multi-tasking, Think like a Pro gives advice, tips, and tricks. Stop procrastinating, and achieve your dream. Like the writer M.A. Lee, in three short years you can become a published writer of more than 12 novels. Purchase the beautiful flowers version here. Purchase the guiding lamp version here. Also available is the Think / Pro planner, a daily companion to keep your goals on track. With an undated layout, you can start anytime and skip any vacation weeks. The two-page weekly spread offers progress meters, word count trackers, healthy habits monitors, and monthly, seasonal, & yearly reviews and previews. Record your victories. Analyze your challenges. Determine your productivity. 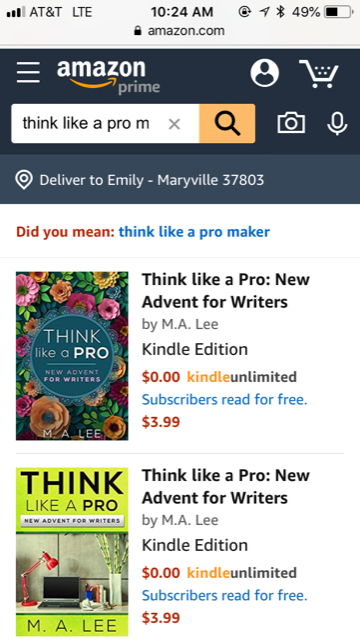 The Think / Pro planner and the Think like a Pro book will encourage your transformation from hobbyist to professional writer.